Every time you switch your television on, tune up your radio, or walk by random billboards and posters on the road, you’re bound to see an advertisement for a new mobile gadget. Whether it be a smartphone, a tablet, or any multi-task mobile device, the new trend of “technology-on-the-go” is growing more and more in popularity. With the increasing popularity of mobile devices comes with it the rapid demand for mobile application software. More and more people are looking for ways to maximize the mobile experience by trying out various mobile applications that are designed to make their lives easier and more efficient. Recruiters are making the most out of this demand by making use of mobile app development methods and taking their recruitment schemes mobile. 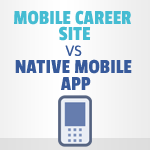 However, now comes the question: Is it better to develop a mobile web app for your site, or a native mobile app? What are the differences? What are the pro’s and con’s? Let’s take a look. To examine the differences between the two, we must first learn what essential features both options possess. A Mobile Web App/Mobile Career Site is essentially a software that is designed to run via a mobile phone’s internet browser. To gain access to the app, users must first have an installed browser on their phones (most modern phones have native browsers installed) and travel to the app by typing in the app’s assigned URL. Native Mobile Apps, unlike Mobile Web Apps, can be directly accessed on your smartphone without having to use an internet browser. Think of native mobile apps as installed software on your computer that’s ready for use with a single click of the button. Mostly, native apps are available for download via carrier services like the Apple App Store and the Google Play Store. The downloading and installation of the app is only done once, and the app will automatically be embedded on your mobile device until you choose to remove it. It’s difficult to compare these two without dissecting further into critical factors that you need to consider before taking your company’s recruitment mobile. Do you need a more inexpensive option? Do you desire freedom in the development of your app? Or would you prefer the low maintenance option? These are all very important questions that you need to ponder on before coming to a decision. So let’s pit these two options against each other, head-to-head, and see what advantages each one has over the other. When you choose to make use of a mobile career site, you save yourself the trouble of having to develop your recruitment software to make it compatible for multiple operating platforms. A web-based application will be available for use regardless of a smartphone’s operating system. For instance, whether you’re on an Android device or an iOS device, running the app through the internet’s browser is possible on both platforms. On the other side, Native Mobile Apps have to be developed to fit certain operating system requirements and parameters. This poses several problems like when you develop an app available for download on the Google Play Store, but not on the App Store, you’re immediately eliminating a substantial bulk of the market from using your app. Cross-platform functionality is only possible if you choose to develop under multiple platforms as well. Unlike native apps that are installed on phones, having to access recruitment site via web browsers seems like a lot of work. But you need to keep in mind that mobile candidates are discovering your jobs and career site through social media apps(such as facebook and twitter) and mobile searches. To add to that, a web-based mobile career site will also tap into the traffic coming directly to your career site from a mobile device. Accessing your careers app via a device’s home screen without having to input a URL might sound a little convenient, but you will end up losing out on a lot of potential traffic and applicants. Native mobile apps appear in app store, markets like the Apple App Store and Google Play Store are so much more accessible to consumers, which helps with exposure to a native app. But you need to remember that on over-crowded app stores its easy for your native mobile app to get buried under competition with other top native apps such as Facebook, Twitter, Angry Birds etc. Mobile users are much more likely to install an app, which they expect to access frequently. Such as Angry Birds for fun, Facebook, Instagram for social interaction and content. Searching and applying for a job at a specific company is a one time process as opposed to a repeat one, and that makes it less lucrative for mobile users to download and use a mobile native app for careers. Unless you have an employer brand that has millions of job seekers ready to work for you, a native app in AppStore or Android is unlikely to deliver expected ROI. On the other hand a mobile career site will not get you any exposure in app stores, but it will help you tap into mobile traffic coming to your career site from multiple sources such as – direct visitors, social media and search traffic. Native mobile apps have high cost of development. You will need multiple apps such as iPhone, Android, Windows, etc. to reach all users, this makes native apps resource intensive to build. Native apps are hard to outsource effectively because you will need skilled resources for different platforms. From a development perspective its so much more convenient to build mobile web apps and optimize your existing career site for mobile devices. Mobile career sites once build will run on almost any phone with a browser. Its faster to produce, requires fewer resources to build and has lower cost of development. When operating under a mobile-based application, the maintenance and upkeep of the app costs significantly much less than native apps considering its ability to adapt to multiple platforms seamlessly. Also, it rids the development team of any hassles regarding software updates, mobile device hardware specs variations, and the like. It’s much more expensive to develop and maintain native mobile apps. When you’re free from operating under the many bureaucracies of developing native apps under iOS or Android banners, it makes the actual development much smoother and quicker. You won’t have to have your app approved by anybody, nor will you be required to have the content of your app adjusted to suit the requirements of others. You and you alone, as a developer, have full control over your app and its placement. When you choose to develop apps under the banners of the App Store and Google Play Store, you’re essentially restricted to operate under the parameters that these companies have set for you. In addition to that, if you desire to charge for the use of your app, or if you choose to install in-app purchase options, then the profits and gains that you may obtain from these purchases are entirely your own. You won’t have to share it with Apple or Android. So what form of mobile application do we recommend? Well, mobile career site is the way to go unless you have some very specific requirements. Mobile career site addresses all the needs of various companies and in most cases it is the most suitable form to take your recruitment mobile. 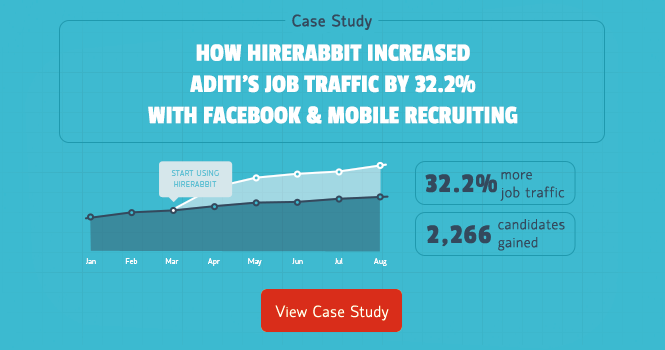 Today a sizable portion(15-20%) of the traffic to your career site is already coming from mobile devices. Candidates are first interacting with you through a mobile browser, rather than a native app, it makes sense to create a great first impression with a mobile career site.